In the market for a brand-new luxury sedan? Do what other hardworking customers near Mandeville, LA, do and reward yourself with a 2019 INFINITI Q50. This vehicle offers so much; it’s difficult to know where to start. From the moment you drive away from the dealership, it will amaze you with the ease with which it handles the road and will let you feel in complete control. If you want an up-close look at the Q50, stop by your local dealership today and test-drive one. When you shop for a vehicle, you love to have options. The 2019 INFINITI Q50 comes in several styles and trims. Each one brings a little something different to the table. You’ll see the following models: the 3.0t LUXE, 3.0t SPORT, RED SPORT 400, and the 2.0t PURE. You can pick either an all-wheel-drive model or one with rear-wheel drive. The Q50 seats five passengers and has a basic warranty of four years/60,000 miles. One of the first things customers near Mandeville, LA, like to do when they shop for a new car is to look under the hood. The Q50 has an engine that will bring a smile to your face. The 3.0-liter, 24-valve, DOHC, V6 engine doesn’t look the part, but it delivers a punch—295 foot-pounds of torque at 1,500 rpm and 300 horsepower at 6,400 rpm. You’ll be up to top speeds in no time, thanks to the acceleration and power. A car’s exterior won’t do a lot for its reliability and performance, but it sure is nice to look at and drive a beautiful automobile. The 2019 INFINITI Q50 will please your eyes, but you can add even more appealing features. Consider upgrading to splash guards, a rear decklid spoiler, premium paint, and even INFINITI radiant welcome lighting. As you sit in the driver’s seat and your passengers come along for the ride, you’ll all enjoy the many interior features while driving near Mandeville, LA. Not only will you find the audio and cruise controls on the leather and alloy steering wheel, but the car also has keyless ignition. Everyone in the car will like the climate control, not to mention the extra storage and cargo space. Customer in and near Mandeville, LA, love the 2019 INFINITI Q50. You need to see what all the fuss is about and get into one as well. 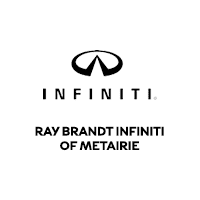 Come to Ray Brandt INFINITI and talk to the sales team about what you can do to make this your next ride.